Asia is currently seeing the rise of a number of terrorist campaigns and insurgent conflicts that encompass ethno-nationalist, sectarian and nationalist separatist movements. Their various orientations, from communist to religious rationales, are driving some cross-fertilization as associated tensions spill into neighbouring countries or become trans-regional in nature. The rise of Islamic State (ISIS) in Asia has long been predicted and Asia is clearly becoming a desired theatre for ISIS, the Marawi siege a point in case. In its heyday, al-Qaeda (AQ) boasted a third of its members from across Asia, so with AQ’s just issued call to arms in support of the Rohingya, broader Islamic fundamentalist sentiments towards the region are being highlighted. Several predominately Muslim nations, Pakistan, Indonesia, Malaysia, Saudi Arabia, led by Turkey have also demanded support and action to help Myanmar’s beleaguered and persecuted Rohingya – adding fuel to the flames of an already simmering cauldron of risk in the region. August 25th 2017, the day when Rohingya Muslim militants launched a wave of attacks on police and military facilities in Rakhine state, could possibly prove the tipping point in the transition of the Rakhine state conflict, and a defining watershed moment in what was a low-level ethno-nationalist insurgency. It now risks turning into something quite different. Amidst frenzied media coverage of the military’s excessive response to the attacks, focused on the growing torrent of refugees, U.N. agencies estimated that as of September 15thnearly 400,000-plus mainly Rohingya had fled Myanmar. Tens of thousands more are thought to be injured and/or internally displaced, in what various U.N. officials described as a “textbook example of ethnic cleansing”. I would say the attacks, launched by a group calling itself the Arakan Rohingya Salvation Army (ARSA), were calculated to trigger the very response that came in the wake of the attacks. The subsequent humanitarian crisis and increased sectarian tensions have been a direct and purposefully crafted outcome, and the Rohingyas remain the victims all around. They are victims of religious chauvinism, in the form of Buddhist nationalistic and sectarian hatred. They are victims of the brutality of the Myanmar regime and military, victims of callous planning and exploitation by the very militants who claim to be protecting and representing them. They are victims of the indifference and dysfunctional self-serving agendas of international bodies such as the U.N. and victims to the seemingly impotent responses from the world. Following on from an attack on three police border posts last October, ARSA militants launched a series of coordinated attacks across north-western Rakhine state, in Ngayantchaung, Minkhamoung, Yeaung Chaungwa, Taungpyo-Letwe, Nwayontaung, Kyaukhlaygar areas in Maungtaw and Maungdaw. The attacks concentrated on police checkpoints and outposts, and foolishly, a military camp. The militants sustained large numbers of fatalities and casualties particularly on the day; official estimates range upward of 400 ARSA fighters and suspected members. About 77 ARSA fighters died during the attacks against the military camp. This was not by any means a combat effective series of attacks, nor for that matter were they sophisticated in any way, contrary to what military commanders have claimed. The attackers were armed with rudimentary weapons and a few rifles and pistols. But their weapons were mainly machetes, knives and swords, supplemented by crude homemade IEDs. Many of the attackers were sent to a certain death or capture. 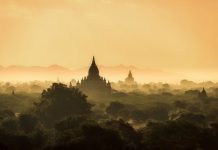 The actual number of attackers is unclear, though informed “guestimates” range between the mid-hundreds to 1,500-plus, [the Burmese military have claimed up to 1,500]. The figures are not verifiable as the region is closed off and information flows are seriously controlled and manipulated, so it is largely speculative at the moment. However, given their lack of proper training and coordination, and the use of rudimentary weapons, ARSA no doubt had sufficient numbers to simply overwhelm the police posts by sheer numbers. This probably also accounts for the high casualty and fatality rate on their side. Some estimates put the number of hard-core militants with some weapons and basic training at around 300 to 400, the balance provided by aggrieved locals who had suffered at the hands of the Myanmar police and military and seized the opportunity to vent those frustrations. But the group’s rationale for the launch and timing of these attacks – and its first offensive, since last October – should really be the primary focus of analysis. The outcome was long anticipated by those behind ARSA. It provided military commanders the opportunity to complete a task started long ago, the ethnic cleansing of North-western Rakhine State, where Rohingyas, unlike any other part of the state, outnumber Rakhine Buddhists and other religions by 9 to 1. ARSA appears deliberately to have handed them the reason to finish what they had started. So why such a callous and calculated move on the part of the militants? What is really behind this and why now? 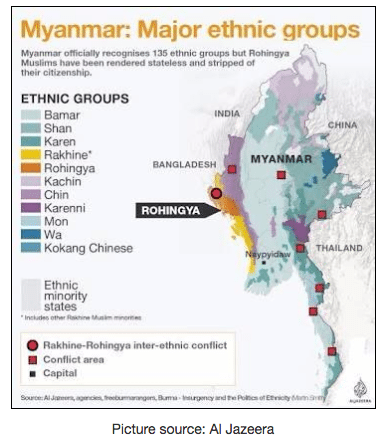 Essentially the build-up to the latest incident can be traced to October 2016 when Harakah al-Yaqin (Faith movement) or HAY (the precursor to ARSA) – though initial claims of responsibility were laid at the door of the highly militant but long dormant Rohingya Solidarity Organisation (RSO) – similarly launched a series of raids and skirmishes against three police outposts and stations near Myanmar’s border with Bangladesh, killing nine police officers and injuring scores more. Yet again the details even now remain unverified, but an estimated 350+ militants were believed or claimed to have been involved in the October attacks. The attackers on this occasion, armed mostly with knives and slingshots, were driven by purpose, to kill and also secure weapons and munitions. They secured an estimated 50 rifles and 10,000 rounds of ammunition, clearly to help implement their grander plans further down the road. The military responded to the October 9 attacks with a typically draconian clearance operation, purportedly targeting militants who had quickly claimed responsibility for the attacks. In their path, though were the Rohingya populace, who were immediately accused of harbouring and supporting the militants. Some 70 militants and 15 security force personnel died in November during these operations to root out the militants. The ensuing campaign also claimed many innocent lives and displaced nearly 90,000 people in what the military termed a ‘counter terrorism offensive’ to eradicate local support and choke off the movement in its infancy. That strategy patently did not work and contributed to a greater supply of willing young militants enraged by the atrocities committed against their people. HAY, Faith Movement, suddenly changed its name from Harakah al-Yaqin to the Arakan Rohingya Salvation Army, as HAY no doubt smacked of radicalism. The intervening nine months witnessed a continuous internal pogrom against alleged Rohingya informants with an undeterminable number killed on suspicion of collaboration with the Myanmar security forces. A few militants were killed in clashes in June when the military said they had been attacked while raiding alleged training camps. The Burmese military clearly understood a momentum was building within the harder line elements of the Rohingya community, and sought to suppress it. Little did they realize, or perhaps care, that their own actions were a force multiplier. Then seemingly out of nowhere came the August 25th attacks, much more coordinated than the previous attacks, but merely in numbers, not militarily. Doubtless some of the liberated rifles from October 2016 have now made the journey home to their owners in the armed forces, or Tatmadaw. The counter-claims by the Myanmar regime against international bodies, NGOs and the Western media, that they are all over-stating and exaggerating the excesses and wanton brutality carried by the Tatmadaw, are indefensible and simply do not stand up to moral or ethical scrutiny. Many hundreds if not several thousand have died, hundreds of thousands are fleeing for their lives, and thousands of homes have been razed to the ground, in an operation that was still carrying on over the weekend of September 23rd and 24th. This should be sufficient evidence for the international community to simply say to the Myanmar government, you can lie to yourselves, but not the world, the world watches in disbelief your actions, you are not worthy of membership of the international community. But yet again we have the wringing of hands and protestations as the killing and carnage continue. 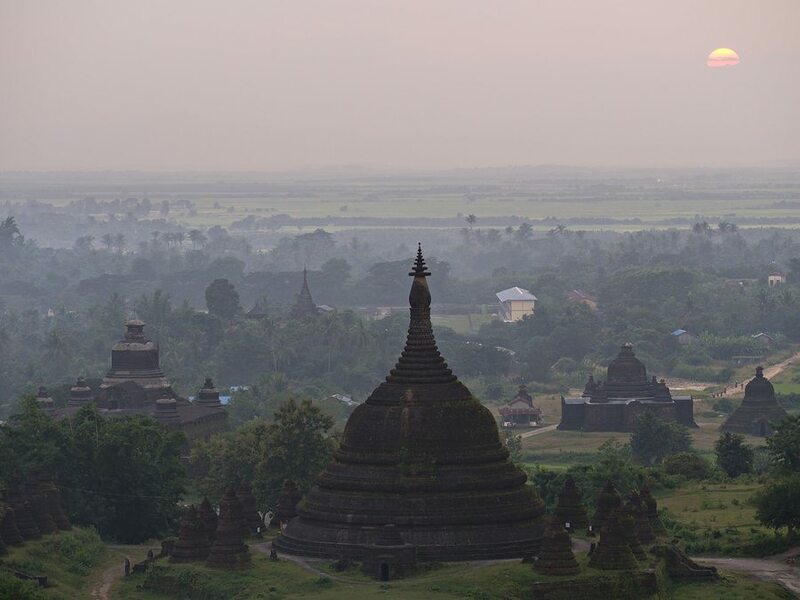 The regional implications of what is unfolding in Rakhine state need to be recognized and acknowledged as potentially reaching way beyond Myanmar. Whilst it is easy for the international community, leaders, organisations and media agencies to berate and heap blame on Aung San Suu Kyi, the somewhat impotent Suu Kyi, de facto head of state, the real architects (the military leadership) continue to pursue their agenda from the shadows. The West put this woman on a pedestal and embraced the leadership of the then-junta, blinded by the opportunities of an untapped emergent market. As a leader (‘State Counselor’) Aung San Suu Kyi has remained toothless and a victim herself of circumstances over which she has no real influence. One must ask where are the re-imposition of sanctions upon the military hierarchy, so intertwined with commerce through their plethora of cronies? Were this North Korea, Syria, or Iran, the sanctions would be coming thick and fast. Perhaps the level of Western economic interest in the country over the past decade outweighs that consideration. So, whilst the West wrings their hands and protests loudly (perhaps the lessons of Bosnia and Rwanda are not wasted on regimes) the Asian nations are either looking away, or those Asian nations with significant Muslim populaces, are becoming increasingly more incensed and resentful of the plight of the Rohingya at the hands of the Myanmar regime. China stands out in its support for Myanmar’s government as well as their overreaction and exploitation of a series of localized incidents. The Chinese approach to their own indigenous ethno-terrorism problem spawned a broader regionalized problem. 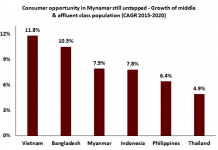 Tellingly, the Burmese are making the same mistakes. Through their actions the Myanmar regime are creating a rallying point for radical sentiments in an already susceptible and volatile environment in the region, and that is precisely what these attacks were designed to achieve, raise the spectre of terrorism and draw a harsh and brutal crackdown, knowing all too well the Burmese military wouldn’t exercise restraint, thereby drawing an international and radical spotlight simultaneously to the plight of the Rohingya. Strategically the folly of such pitiful attacks against a much superior and ruthless adversary has blinded observers to this rational. The actions of ARSA are being construed purely as a manifestation of utter desperation and frustration. What could they really seek to achieve with such a wanton waste of human life and resources? They had no alternative. The response so far has shone a light yet again on a corner of Asia that remains a bastion of military dictatorship, a dictatorship that cleverly stepped aside in 2011 to allow tokenistic democracy to take hold, whilst never fully relinquishing control. The actions of the past three weeks allow that same dictatorship to marginalize again the democratic voices in the country in a time of crisis, demonstrate the weakness of democracy and reassert their authority. Whilst the ire of the international community is focused on the beleaguered Aung San Suu Kyi, the real power behind the throne, the generals, can yet further marginalise her and the fledgling democracy she once represented. And with a large dose of irony they can retake with stealth what was theirs with the vast majority of the nation supporting them. 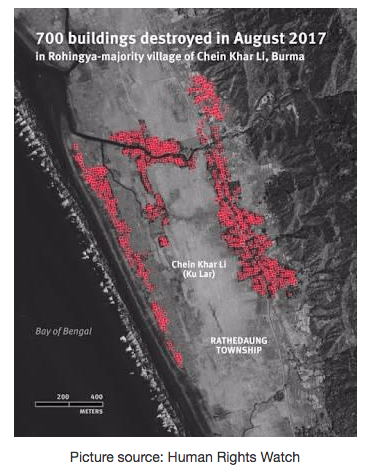 There is also a personal element that adds a sharp edge to the military “clearance operations” aimed at Rohingya communities: their attempts in earlier periods, particularly in 1942. The broader price to be paid for this xenophobic and nationalistic, systematic and vicious abuse of a minority for their own ends is a contagion of radicalisation, already burgeoning regionally, to embed yet further. This is the real risk, amidst the human travesty and misery and real terror inflicted on a disenfranchised minority, of what is happening in Myanmar today. ISS Risk, a frontier and emerging markets political risk management company covering North, South and Southeast Asia from headquarters in Hong Kong.